One of my favorite things is homeschool curriculum. I love planning for each new homeschool year and making our curriculum purchases. That new curriculum represents my hopes, dreams, and goals for that year. Never mind that quite of few of those dreams crash and burn and some of the goals are never achieved…Yet, with each new year and with every curriculum purchase, I remain ever-hopeful. With all the homeschool curriculum choices, have you ever wondered how to choose? Do you feel overwhelmed when looking through catalogs and convention vendor halls? Yes, I do too. Even the most seasoned mom feels overwhelmed by the many choices. So, how should you decide which curriculum is right for you? Be sure to tune in each Monday for my new series on choosing curriculum for your homeschool. For starters, I’m going to let you in on a secret. I choose the curriculum that I like. I don’t always take my kids into account with my curriculum decisions. After all, shouldn’t you carefully watch your child to see their learning styles? Shouldn’t you choose a curriculum that works best for your child? 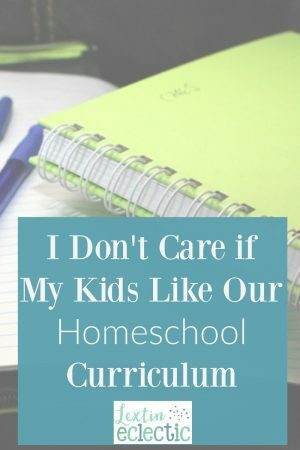 Yes, you do want to think about your sweet little students when you choose homeschool curriculum. Do consider their needs and their learning styles. But in the end, you get to choose. So choose something that you like. Isn’t that freeing?? Go ahead! Make that purchase. I’m giving you permission to choose a curriculum because you want to use it. I used to really stress over choosing curriculum, worrying that something would not work well for one of my children or worrying that I was making all the wrong choices. Then I had an epiphany: If I choose a curriculum that I am super excited to use then I am able to make it work for my children because I am passionate about teaching it. My excitement becomes a contagious. It’s crazy, but the curricula that work best for my kids are the ones that I LOVE to teach. I had to sit down and think about how I like to teach, what types of things I enjoy learning, and what style works best for me. This helped me narrow my focus. Once I knew what I was looking for in a product, I did my shopping. I ended up with a lot of resources that I loved using. And guess what? I make them work for my kids, and it’s been just fine. In fact, it’s been great. I’m a happy homeschool mom and my kids are swept into my enthusiasm (well not all the time, but one can dream). Are you hearing that? I just helped you lower your stress level when you go curriculum shopping. Find a product that you love and dive right in. I bet you’ll be able to customize it for your children and make learning exciting for them – all because you are enthusiastic about it. Go curriculum shopping with confidence this year! Find resources that inspire you and add them to your homeschool. I bet you’ll experience some serious homeschool success! Ohh, and sometimes things don’t work out as planned. It’s ok. Go back next year a little bit more seasoned and a lot wiser as you make your decisions. ← Can You Restart Your Homeschool Curriculum? I never really thought of it that way but I do find that subjects/ books that I am excited about teaching tend to go over better than those I am teaching because I feel like I must or because someone recommended it to us but I didn’t really like it. I’ve found that to be true as well. We have much better experiences with resources that I’m excited to use. And we learn so much more because I’m more invested in the curriculum.